Always, at this time of year, I find myself getting impatient, although I love a winter garden, particularly these last couple of winters, when we’ve had rain, as everything is green and lush. It’s all so still, hovering on the edge of its imminent potential. But, by now, there’s not much to do except wait. 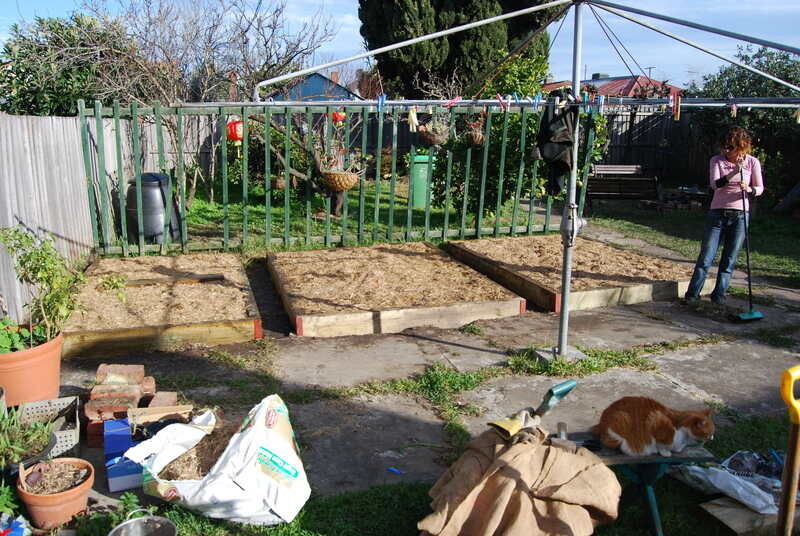 Wait for the winter veges, planted a couple of months ago, to come into edible being; for the seeds in the hot house to sprout and grow to a size ready for planting out; for the spring bulbs and irises to flower. Even the grass is looking after itself and we’re waiting for the right time to mow. So, while I’m waiting, I thought I’d start this blog, which has been rumbling around in my head while my hands are covered in dirt for a long time. When friends drop over, I’m usually in the garden. If it’s raining or too cold, and I’m not in the garden, then I’m not really happy. I like to share what for me is the equivalent of a painting, or many, many different paintings. A garden is always an aesthetic pursuit, as much as it is a practical one at the same time. The combination of form and function has been a preoccupation of much of the last two centuries. To create a garden, you need to sit in it, watch the fall of light and shade, the angle of the sun, and follow the different lines of perspective, trying to imagine what something will look like in a few months time. This garden began in winter, so it’s appropriate that I start this blog now. We moved into this house in May 2011, and the garden (that which set my sights on getting this house) was a mess. 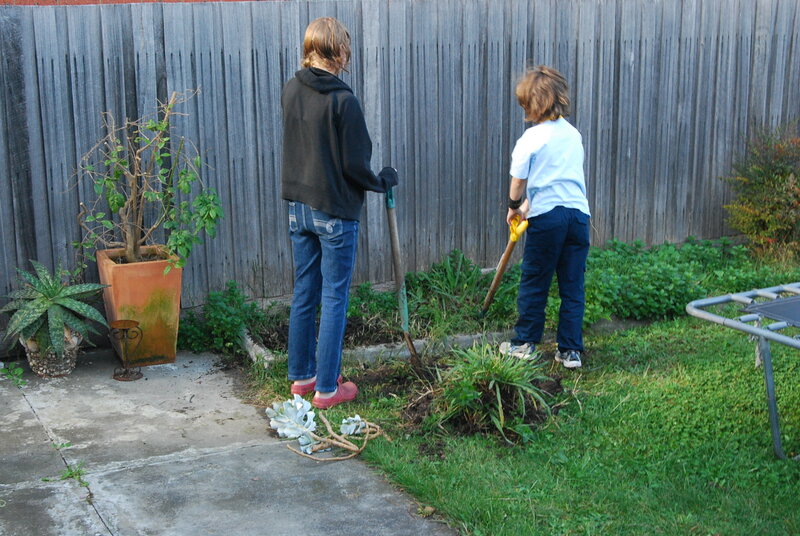 Within a couple of months we were eating food from the garden and the old fruit trees were coming back to life. It doesn’t take long. The garden not long after we’d moved in, with the new vegetable garden beds in place. Where we began: the side bed along the fence, facing west. I realised recently that I have been gardening for 25 years, building a garden in every rental house I’ve lived in, even those with only a square of concrete. Over the years I’ve accumulated a lot of know-how, along with a few disappointments here and there. More on these at some other time. This garden, on the beautiful Thornbury street of Shaftesbury Parade, is without doubt the most fulfilling and the most productive. We have been eating from the garden almost exclusively for nearly two years; this year I am propagating from my own seeds so as to become completely self-sufficient. So, back to winter, although a day like today is about as far from winter as you can get. A powerful northerly (as an Aquarian I have a deep dislike for the wind) and a temperature more like spring. The unpredictable nature of the seasons now makes gardening just a little more challenging, as many plants need the cold, or the right amount of rain (last year my peas failed, due to too much water. I saved the seeds from the ones that survived and have a great crop sprouting as we speak). But then, I expect that the seasons have always been a bit unpredictable in Australia, and at least, here in the south-east, we can grow food all year ’round. In many ways, that’s why I can’t live anywhere else. 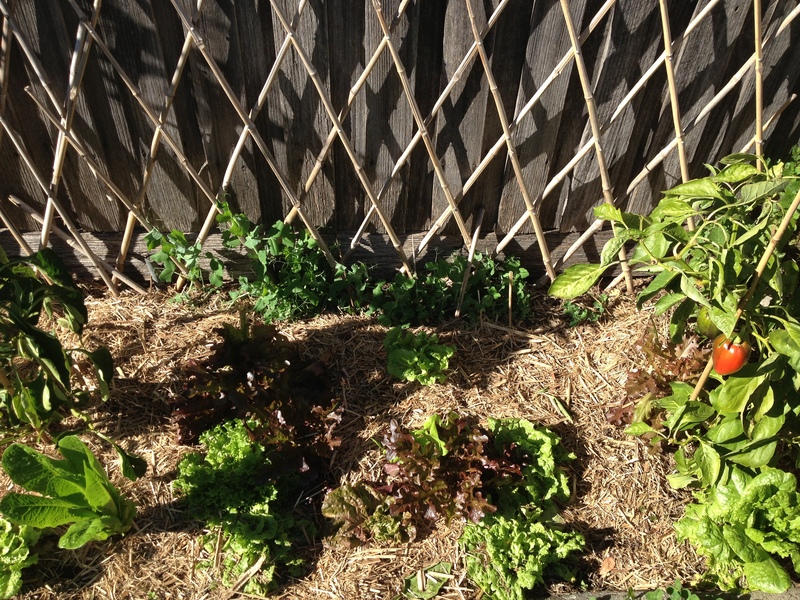 The west-facing fence (as above), with capsicums still turning red, peas beginning to climb the wall and some very happy lettuce. Next time I’m sitting in the last of the winter sun for the day, with the yellow and orange calendula still and stark against all the green, I’ll take a photo and post it here. Today, I want winter back (apparently it’s on its way for the weekend) so I can take in the hush and the chill, and enjoy the waiting, knowing that just a few months down the track everything will have burst into life. Postscript: I thought I’d better add a postscript to today’s (inaugural) post, given the drama played out in the natural, and the garden, world today. First, as recounted above, we had strong northerlies (warm winds) and hot sun for the first few hours of the day, during which my new hothouse blew over and undid weeks of propagation. Yes, I got a bit stressed by that. 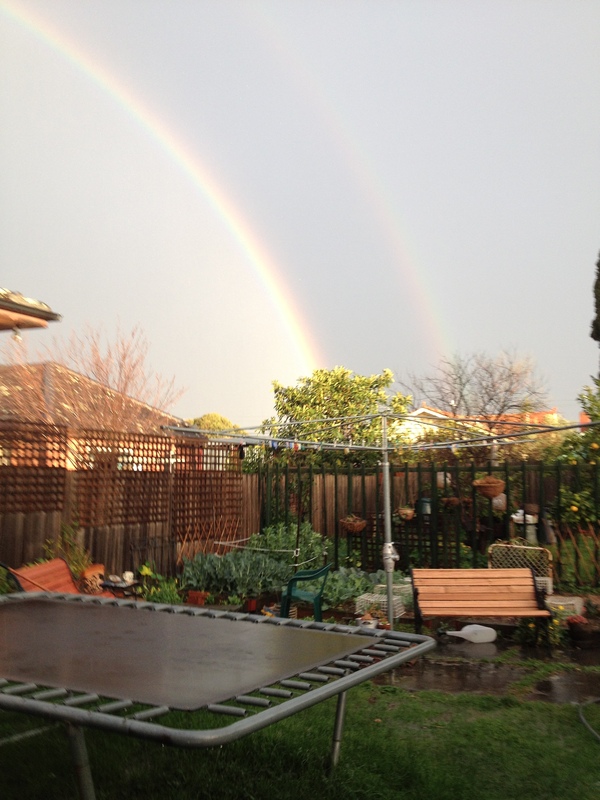 Then, an even stronger south-easterly and thunder, then buckets of rain, then a sun shower with a double rainbow (see below). Now, it’s kind of still and dark and grey, and everything around here looks very, very green. Good for you. We live on 20 acres near Lake Eppalock and it was nothing but rubble and clay. 20 years later I have created a reasonable garden inside our house paddock. My greatest joy is giving away surplus product and creating new beds. Good luck with the new blog. My garden defines who I am. I couldn’t agree more. I wish I had 20 acres. Thanks. I am also waiting for the second installment – envious of the productivity and quite happy to fast track my green finger knowledge with your tips. What a moody day Mebourne provided for the backdrop of your first gardening blog. Thanks Sophie. Lovely to see you here. Hope all is well with you and the family, many of whom might have flown the coop, or be near to it? Thanks for the quick and complimentary comment. In some ways I expect the Midwest is a bit the same as the south east of Australia, except your winters are much, much colder. I know, I travelled through one, twice!